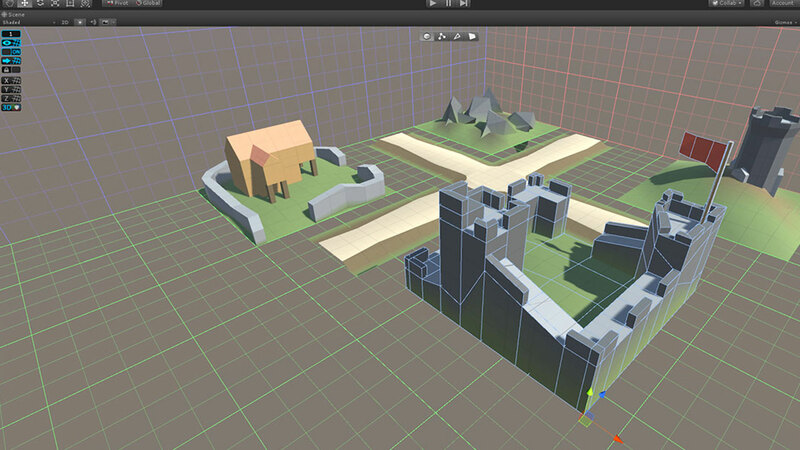 Design, prototype and play-test levels rapidly in the Unity Editor. Now part of Unity, ProBuilder is a unique hybrid of 3D modeling and level design tools, optimized for building simple geometry but capable of detailed editing and UV unwrapping too. Use ProBuilder to quickly prototype structures, complex terrain features, vehicles and weapons, or to make custom collision geometry, trigger zones or nav meshes. 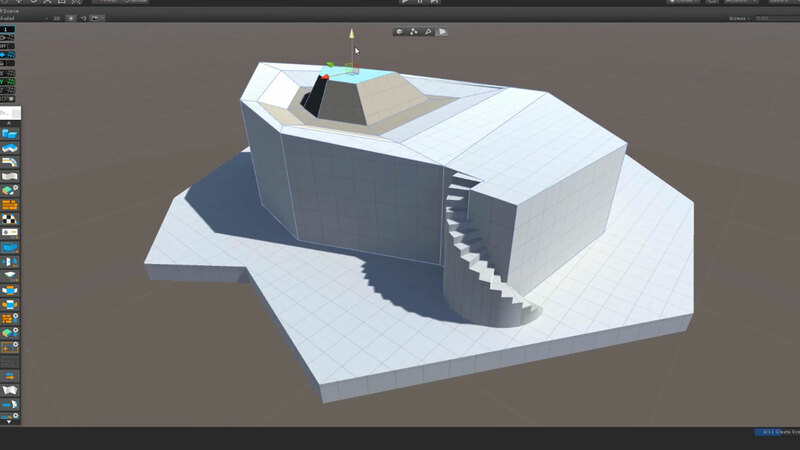 ProBuilder also takes advantage of Unity’s seamless round-tripping capabilities with digital content-creation tools (like Maya), so you can further detail and polish models with your favorite tools. 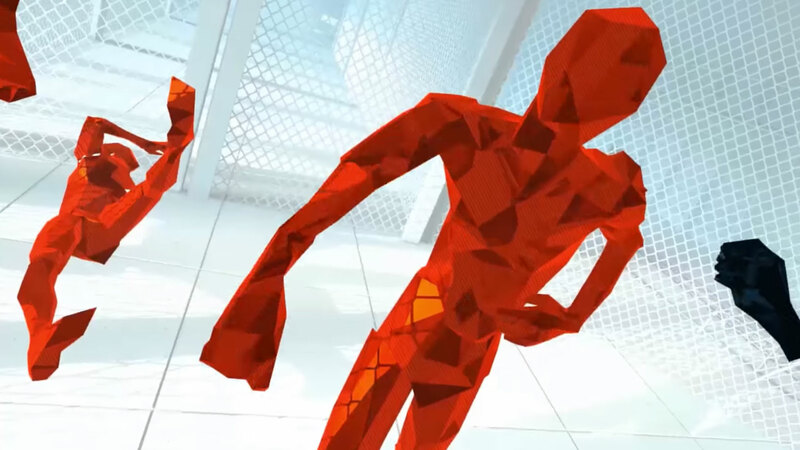 Many Made with Unity games feature ProBuilder modeling and level designs, including SUPERHOT, Tacoma, Tunic, Manifold Garden, Super Lucky’s Tale, DESYNC and more. Select any face or open edge, and simply hold Shift while moving, rotating or scaling to extrude or inset. You can shape objects in any form. You can even extrude multiple faces/edges at once. You can flip the normals of all faces on the selected object(s), which is especially useful for converting an exterior modeled shape into an interior space. You can use the Mirror action to create identical copies of objects and make symmetrical items: Build one half, mirror it, then weld the two together for a perfectly symmetrical result. 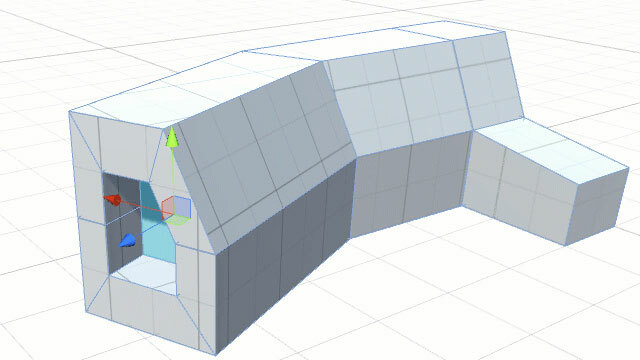 Once you create a Poly Shape, you can edit its control points and other settings at any stage. In the Scene view, simply click to add control points. These will form the outer bounds of your mesh. Once you finish placing points, press Return to finalize the shape. Even after the initial creation steps, you can still modify a Poly Shape. 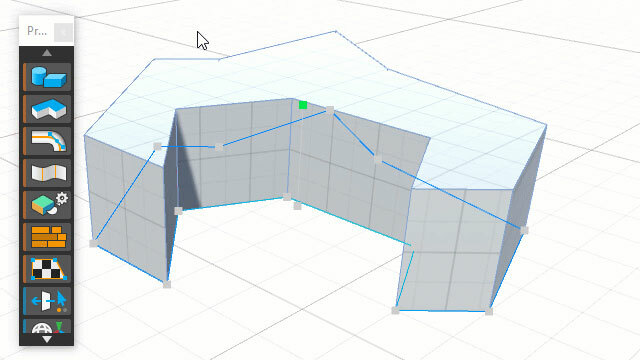 You can move existing control points by clicking and dragging, add/remove new points or even flip the normals. Customize the toolbars to fit your needs, and take advantage of the ProBuilder window, which is a “smart toolbar,” to dynamically match your current edit mode and element selection. Modify default settings, shortcut keys, resize the Toolbar, and switch between text and icon modes. ProBuilder will reorder the icon or text content to best fit the window size. 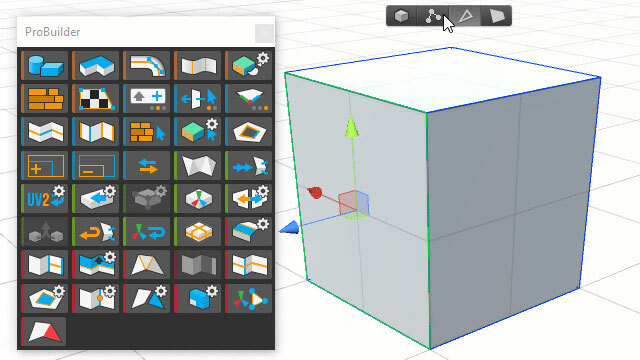 The Toolbar is color-coded to help you quickly choose tools by type: Orange for Tool Panels, blue for Selection Tools, green for Object Actions, and red for Geometry Actions (Vertex, Edge, Face). Most ProBuilder windows can be changed from docking to floating or vice-versa through their context menu. ProBuilder features a complete UV Editor window for manual unwrapping and fine-grained control, including projection modes, UV welding, seam control, element pivots and much more. 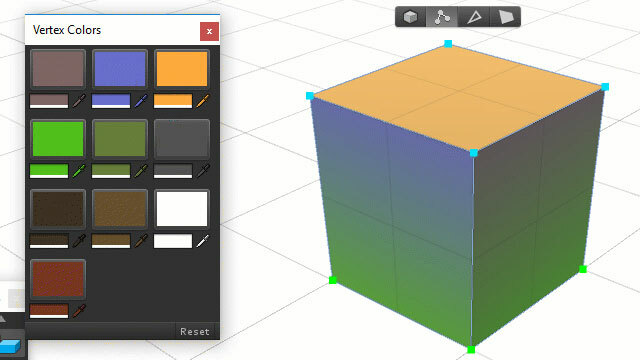 Auto UVs: Use this for simple texturing work, especially architectural or hard-surface items. Tiling, offset, rotation, and other controls are available, while ProBuilder automatically handles projection and updates as you work. Manual UV Editing: Use a full UV Editor to precisely unwrap and edit UVs, render UV templates, project UVs and more. You can use a mix of auto and manual UVs, even on the same object. This is especially useful when some parts of a model need tiling textures, while others are unwrapped. 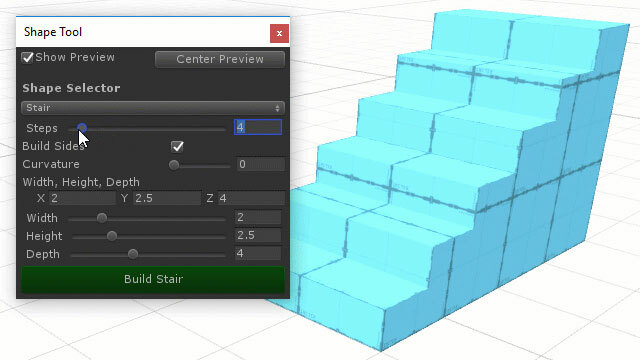 Create new editable shapes like cylinders and stairs. Each shape has specific properties that can be customized before creation. For example, the Stairs shape lets you choose items like step height, arc, and the parts of the stairway to build. Choose a shape to start with, then set unique parameters, such as height, width, depth, and number of cuts. It includes many shapes, including: Cone, Arch, Pipe, Stairway, Door, Cylinder, and Sprite. Quickly apply overlay colors to individual faces. Vertex coloring is also especially useful for early map testing and designating team areas. 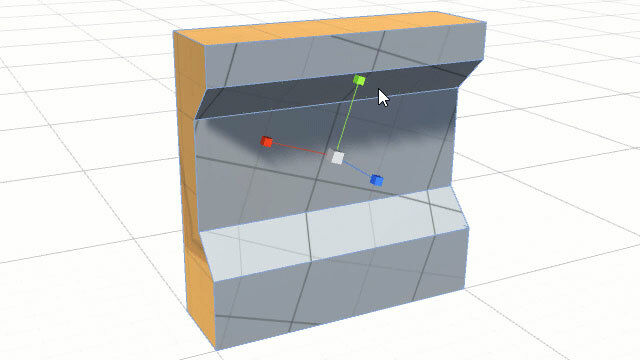 You can do more with vertices in ProBuilder; for example, collapse all selected vertices to a single point regardless of distance, merge them within a set distance of one another, create a new edge connecting the selected vertices, or split a vertex into its individual vertices so that they can be moved independently. ProGrid gives you both a visual and functional grid, which snaps on all three axes. ProGrid enables speed and quality, making level construction incredibly fast, easy and precise. It is especially handy for modular or tile-based environments, but it also significantly speeds up workflow and increases quality for all types of work. Combined with ProBuilder, ProGrid enables faster and more precise geometry construction. ProBuilder comes with Unity 2018.1 package management. Follow this link for instructions to activate it. For Unity 2017.x, use the version on the Asset Store. Refer to the documentation, and check out the tutorials. Be sure to check out Polybrush.